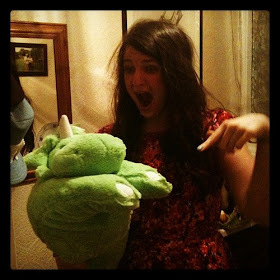 t*rexes and tiaras: And now I fall in love with somebody everyday.. I was on a sewing roll on Sunday. I managed to get two dresses made before 2pm, when I headed out to tackle some weeds at the allotment. It was my first weekend home with "nothing" to do for a while. I am pretty hopeless when it comes to spending time relaxing, as I find it impossible to do nothing but I think that sewing worked as my relax time last weekend, and I was pleased with the dresses I made. 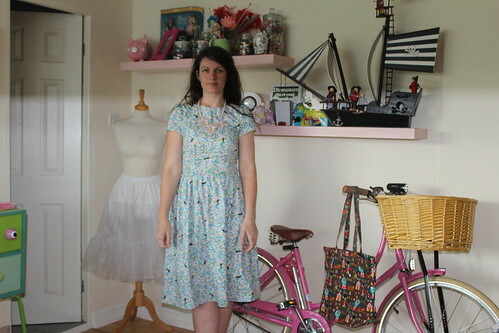 Almost every dress I've made lately has been with a gathered skirt. What can I say - I'm lazy and they're incredibly easy to do. But not this one. This Cocoland fabric, (which I bought from Frumble) was a little heavier than my usual cottons, so I wasn't sure how well it would gather, and therefore went with the regular skirt from NL6223. I lined it with some yellow gingham which I had left over from making the guides some neckers for one of our recent camps. I really like the way the colours in this print give me so many matching options. I am starting to have to really think about what shoes I have left to wear in my #irregularchoicechallenge and when I realised I was yet to wear these yellow gingham heels, I thought this would be the perfect match. 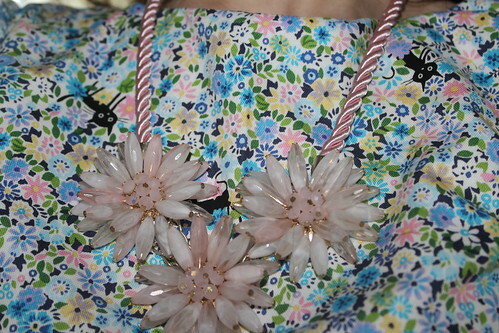 I also love the way the necklace goes with this fabric. I hope I have time soon to use up some more of the fabric I've recently purchased - I seem to be stashing quite a lot at the moment and am telling myself no more fabric purchases until I've used it. Fat chance! I did take advantage of the Jaycotts promotion on zips the other day and order myself about 40, making sure I have the right colours for the fabrics I've been buying of late, so I hope they turn up soon. I find them the best price for zips of anywhere I've found anyway, so when they were offering 20% off all zips, it was a bit of a no-brainer. Love the dress and the necklace does look perfect with it. 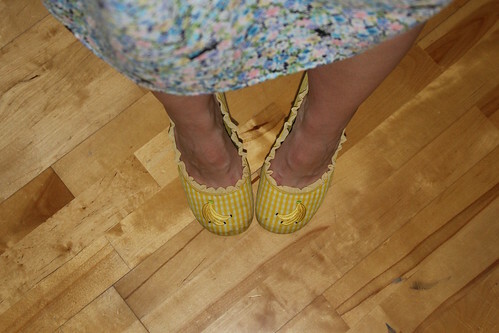 Thanks - they match the yellow gingham lining! 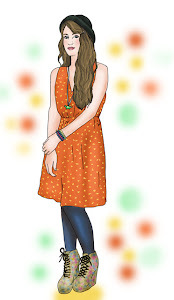 I just stumbled across your blog and was drawn in by the IC shoes. Then I saw you made 2 dresses in a day..that seems amazing to me! I want to learn dressmaking but I have no idea where to start. How did you do it? Is it worth going to a class or is it possible to self-teach? I don't want to go to a class. Sorry for all the questions on my first visit here.. Hello!! I got so much out of my dressmaking lessons, I think because I'm a much more visual learner - I like to be shown how to do something rather than trying to read it on a page. That said,I'm sure that you would be able to self-teach ( I know a lot of people who have done so and there are so many blogs and youtube videos which would be able to help). I love making dresses and find it fairly quick now because I know which order makes most sense to put things together in, and I cut out a few projects at a time and then sew them all at the same time - i.e I'll put two or three bodices together, then press them all etc etc. Good luck if you decide to give it a go, and thank you for your comment!